We’re rapidly heading into the shortest online holiday shopping season since 2002, and it’s gearing up to be the biggest yet. 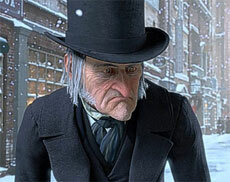 Make sure you’re not committing any of these common scrooges to maximize your holiday marketing effectiveness. A big problem with Web analytics is it only measures what has happened, but has a harder time predicting what’s upcoming. Even predictive analytics rely on has-happened data. Using last year’s data to predict customer behavior this year is sub-optimal, and doesn’t account for the fact that this year’s span between Black Friday and Christmas is 6 days shorter than 2012. The short season affects more than daily sales targets. 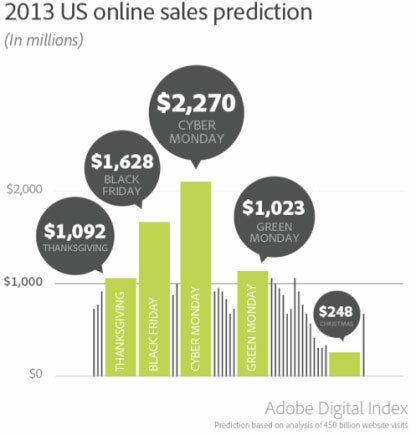 Adobe Digital Index predicts this Cyber Monday will break the $2 Billion mark, a 15% jump over last year. Thanksgiving traffic is expected to be 21% higher than last year, and Black Friday 17%. Are your servers prepared for potentially 20% higher traffic on these days? Consumer response also changes depending on your competitors’ tactics. Are they offering door-busting deals before Black Friday? Are they bidding higher in pay-per-click during the shorter, more aggressive season? Similarly, your merchandising strategy should not be guided by last year’s patterns but this year’s trends (think current, external data). Echoing the above, a shorter holiday shopping period requires more aggressive marketing. Though many consumers may still hold out till the turkey’s digested, pre-Thanksgiving marketing is critical this year to catch the early birds. Late November’s Thanksgiving is a US tradition. If you’re blasting Black Friday and Cyber Monday sales to your global list, what percentage of subscribers will find the marketing irrelevant or untimely? 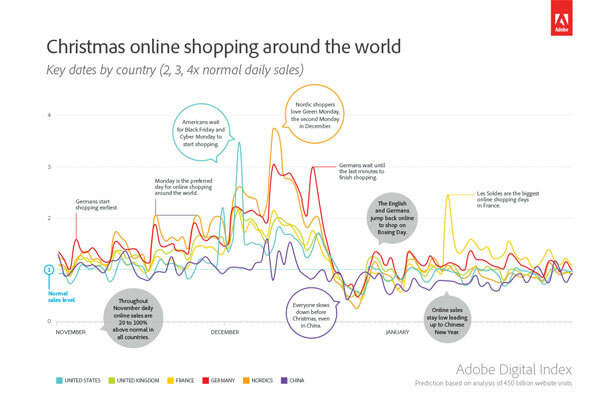 Adobe Digital Index graphs how online shoppers in the US, UK, Germany, France, China and Nordic countries behave during a typical holiday season. In light of this data, how might you tailor your merchandising and promotional strategy via email, and present your geo-targeted home pages? Mobile commerce is predicted to be up 40% year-over-year this season, and mobile (smartphone) search will play a major role in research (though tablets have higher conversion rates, and are lumped into desktop targeting in Adwords). Ensure you’re not running mobile PPC campaigns without sending visitors to usable landing pages. Ensure your pages load quickly (which affects your ad ranking and campaign performance), use large text and calls to action that are finger-and-thumb friendly, and ensure images are appropriately scaled. 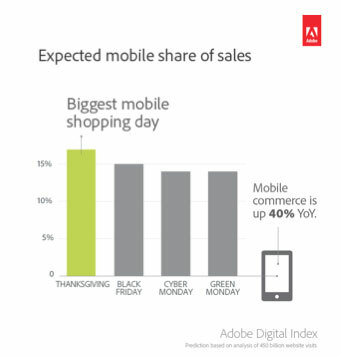 Adobe predicts mobile optimized sites will have as high as 20% of sales completing through mobile this year. I don’t need to know what your domain is to tell you you’ve got more than a single digital marketing channel. At a minimum, you’re running an email program, and being found through organic search. You may have an affiliate program, use comparison shopping engines, pay-per-click ads, display, remarketing and social media. And returning customers are typing your address directly into their browsers. In other words, you’ve got a number of referral touchpoints, and many customers will make multiple touches on their journey up to checkout. Google Analytics reports that, on average, customers interact with a brand 4.3 times over a two-day period before making a purchase, and consults 10.4 media sources for research, including social media. Last-click attribution, the default model in most web analytics tools, fails to assign credit to these touches, only crediting the last touch, which makes it difficult to measure the value of social, among other sources. 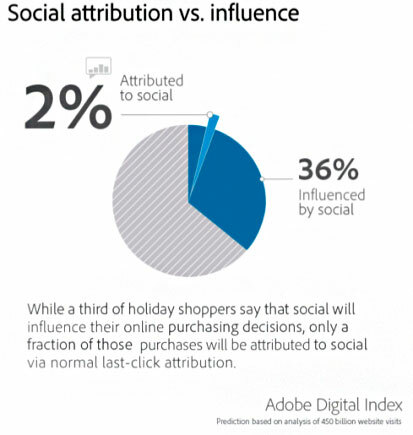 According to Adobe Digital Index, 36% of consumers believe social media will influence their holiday purchase decisions, while only 2% of conversions will be attributed to social due to last-touch attribution. The good news is modern analytics tools have evolved to support multichannel funnel views, including Google Analytics and Adobe SiteCatalyst. These reports enable you to analyze common visitor paths to purchase and will help you better understand what strategies were effective, make better budget and effort allocations to various marketing activities going forward, and avoid over-and-under investment based on flawed attribution. If you want to read up on multi-channel attribution models, I recommend Avinash Kaushik’s work Multi-Channel Attribution: Definitions, Models and a Reality Check and Multi-Channel Attribution Modeling: The Good, Bad and Ugly Models. Though this article is geared to the upcoming holiday season, you can apply many these scrooges to any peak season that may apply to your business. Next articleCan Staples Succeed as an Everything Store?